Businesses using QuickBooks Payments to process credit cards have to pay QuickBooks merchant account fees, including monthly fees, transaction fees, and batch fees, which can add up over time. With EBizCharge, merchants pay significantly less for a better, more secure service bolstered by comprehensive customer support and features. With EBizCharge, merchants pay substantially less for credit card processing. Our QuickBooks integration collects detailed data from each transaction and sends it to the card-issuing bank, reducing the risk of each transaction and ultimately lowering interchange and other fees. In addition, we offer a flat rate program with no batch or transaction-based fees and no contracts. We also help merchants save time and money with EBizCharge Connect, our online portal where your customers can view and pay their outstanding invoices. Once payment is accepted, the portal communicates with QuickBooks and automatically updates your accounts receivable and general ledger. If needed, merchants can also send out automated payment reminders via email. With EBizCharge Connect, merchants spend less time in accounts receivable, and the payment process is seamlessly automated. 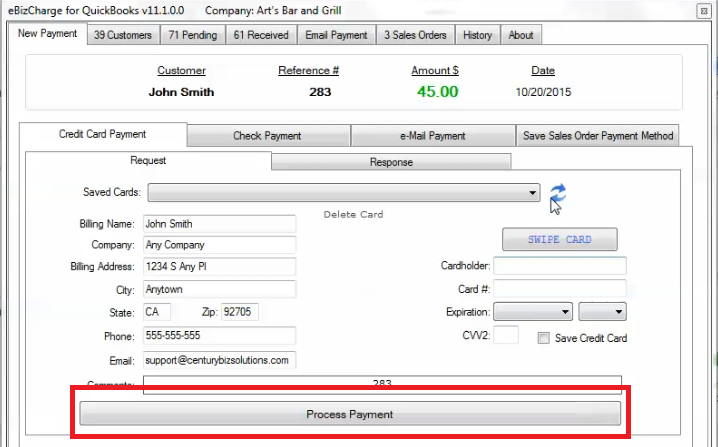 The EBizCharge QuickBooks integration allows merchants to accept payments with one click of a button. 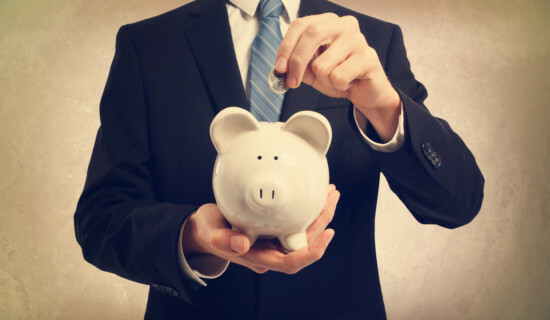 Lower cost and better efficiency aren’t the only benefits that EBizCharge can offer. When merchants use QuickBooks Payments, they can save customers’ credit card information in the module. However, this information is stored locally—meaning that if someone hacked into the merchant’s system, they could easily steal sensitive credit card information, leading to thousands of dollars in damages for merchants. With EBizCharge, credit card information is tokenized and securely stored on our cloud server. Tokenization is an advanced data security method that replaces sensitive data (such as credit card information) with a valueless token, usually composed of a string of random characters. With tokenization, merchants can confidently protect their customers’ information. If someone did manage to hack into a merchant’s system, they would find tokens instead of credit card numbers. Our system is PCI compliant and protects merchants from liability. Anyone familiar with QuickBooks merchant services knows that trying to reach someone for support can result in hours-long phone calls. Intuit simply can’t keep up with the sheer volume of merchant questions and requests. But with Century Business Solutions, our in-house support team in Irvine, California, ensures that merchants reach a live person in the U.S. any time they need help, providing on-demand, comprehensive support. In addition, our dedicated chargeback team monitors merchants’ transactions, immediately notifies them when a chargeback is filed, and assists with the chargeback process, including rebuttal letters, gathering documents and information, and answering any questions that merchants may have. With EBizCharge, accepting credit cards through QuickBooks is low-cost, painless, and secure. We offer low rates and increase efficiency through features such as our online payment gateway and EBizCharge Connect. If you’re seeking a way to lower your QuickBooks merchant account fees, choose EBizCharge.